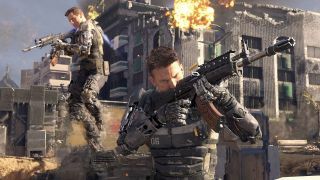 A charitable fund might not be the first thing you think of when Call of Duty comes to mind but Call of Duty Endowment was founded by Activision and Blizzard CEO Bobby Kotick back in 2009 to help military veterans transition back into civilian jobs. In eight years it’s raised more than £19 million in funding via Call of Duty and placed more than 37,000 US veterans in full time jobs. Not bad going. Until now the organisation has been US only but Call of Duty Endowment is now expanding to the UK, letting British gamers help support veterans through gaming. To help, you can pick up the Double Duty Calling Card right now in Call of Duty: Black Ops 3. This cosmetic micro-transaction nets you an animated Calling Card that allows you to proudly show your support for the Endowment. It evens shows a veteran going from uniformed soldier to civilian. Plus, you also get three rare supply drops as well as those general fuzzy feelings for doing a good thing. The Double Duty Calling Card is available right now in Black Ops 3 and all proceeds received by Activision for these digital bits goes towards the Endowment programmes. Gaming publishers are no stranger to amazing charity. Bungie raised more than $1 million for Nepal back in 2015 and more recently created a custom emblem for those who donated to aid for the flooding in Texas this year. Incredible work all round. Keep it up gaming peeps!